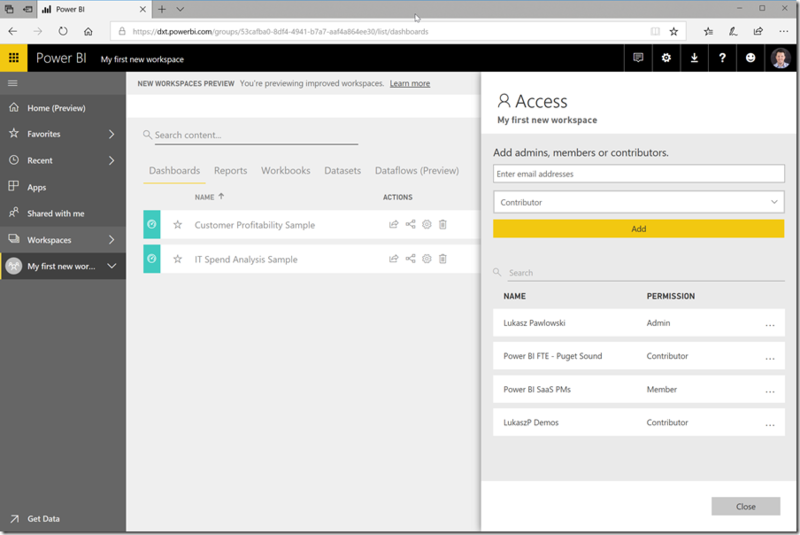 Today, I’m excited to announce the public preview of a new workspace experience in Power BI. The new workspace experience is designed to enable enterprises to easily manage Power BI content at scale. Note: The public preview is starting to roll out this week and will be enabled for all users by Saturday 8/11/2018. When we introduced App Workspaces in May of 2017, we focused on the importance of enabling a data-driven culture, so business users can make better, faster, data-driven decisions. We’ve seen Power BI apps take off, with tens of thousands of apps being installed monthly. We’ve also heard your feedback that managing user access to workspaces with user groups was essential to managing Power BI content at scale. Below, we’ll give you an update on our work and introduce these new workspace experiences to you. Here’s the snapshot what’s new and changing. Read below for all the details. Why are we make these changes? We’ve listened to feedback on how you desire to enable collaboration and content management of Power BI content. In many large organizations, there are IT processes built on top of security groups, distribution groups, and even Office 365 groups. The new workspace experience enables organizations to manage access to workspaces, give access through sharing individual items, and give access to Power BI apps using security groups, distribution lists, Office 365 Groups, and to individuals. To try the new workspace experiences, start by clicking Create app workspace. The new “Preview improved workspaces” and click Try now. The preview is opt-in, meaning you can continue to use our existing App workspaces build on Office 365 Groups. However, when you press Try now, you will start creating your first workspace in the new workspace experience. After pressing Try Now, you can create a new an app workspace without creating an underlying Office 365 Group. You can provide an image, and workspace name, a description, and under Advanced choose whether to place it in a Power BI Premium dedicated capacity. After the workspace is created it behaves similarly to existing App workspaces. You can add users through the Access pane, add content using Get Data, share, collaborate, and so on. You can press the Skip link to access the content list of the workspace right away. When you access the workspace’s content list, you’ll see a few differences. There is a banner for the new workspace preview. You’ll see new buttons for Access and Settings. The Access pane will be your first new workspace experience. You can add any kind of user group, security groups, email enabled security groups, distribution lists, Office 365 groups, or individuals, to any of the workspace roles. In the screenshot below you’ll see a mix of group of all the kinds referenced above. The role is given to everyone who is in that user group. As user group membership changes, the access to the workspace is updated automatically. In the screenshot above you’ll see there is a new Contributor role, which is described in detail below. Allowing users to get access to the content they need, at the right permission level is fundamental to managing content at scale. 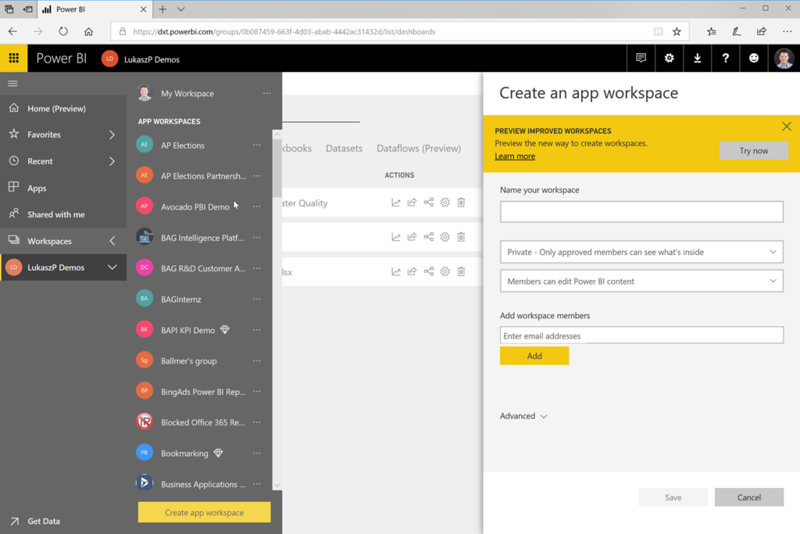 When designing the workspace roles for the new workspace experience, we took into account all the options available on existing Office 365 Groups based app workspaces. The Member and Contributor roles that are available in the Public Preview and the Viewer role that will become available closer to the GA, make explicit options that previously were hidden within the Office 365 Groups settings. This means that workspace Admins can at a glance understand what level of access a user has without checking the Office 365 Group settings. The roles do not affect licensing requirements. Your users still need Pro licenses to access content directly in workspaces to edit or contribute content. They’ll either need a Pro license or the workspace will need to be in a Power BI Premium capacity to allow read-only access through sharing and Power BI apps. Since users can be in multiple user groups, each user gets the highest level of permission granted to them across all the role assignments on the workspace or at the item level. New workspace experience preview workspaces no longer create Office 365 Groups. So you’ll use the Power BI Admin portal, and new Power BI Admin REST APIs and PowerShell commandlets to manage the workspaces. In the Power BI Admin portal, under Tenant settings, a new setting controls who can create workspaces using the new workspace experience preview. By default, the setting uses the same value your organization set for who can create Office 365 Groups. When you set a new value, the value applies only to the new workspace experience preview. Conventional app workspaces built on top of Office 365 Groups, continue to be governed by the Office 365 setting. As we go forward with the preview, we will add more options into the Power BI Admin portal and Power BI REST API for Admins to ensure you Admins can delete, restore, add/remove Admins in workspaces that use the new workspace experience. As we start introducing the new workspaces in public preview, we wanted to share how we’ll transition from the current App workspaces built on top of Office 365 Groups to the workspaces built on the new workspace experience. Today we’ve announced a public preview of the new workspace experiences. 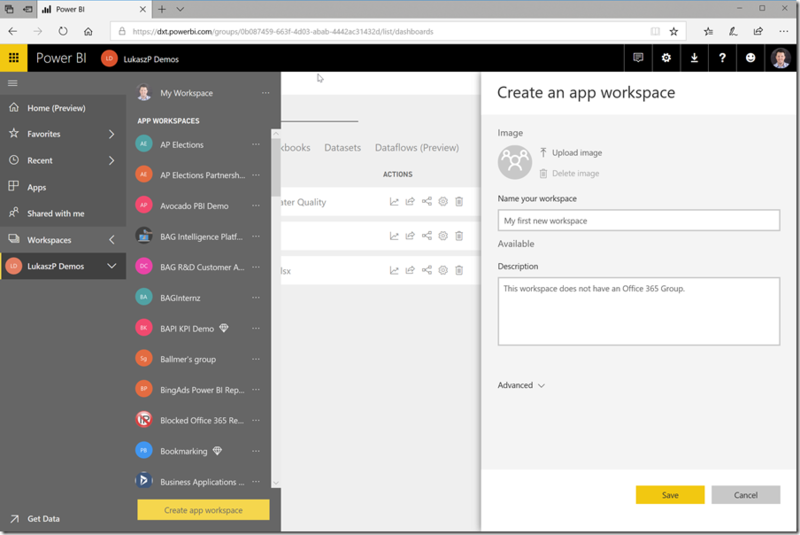 During the Public Preview App workspaces built on top of Office 365 Groups are the default and users can opt-in to create workspaces using the new workspace experience. When we reach General Availability (GA) for the new workspace experiences, all workspaces will be created using the new workspaces infrastructure. We will discontinue the ability to create workspaces that create an Office 365 Group. We will add to the new workspace experience a setting where you can associate a workspace in Power BI with an Office 365 Group, which will enable similar capabilities as today’s App workspaces such as seeing the Office 365 Group’s OneDrive in Get Data and the Files menu for quick access to the OneDrive. Additionally, we’ll start offering the ability for users to migrate their existing Office 365 Group based workspaces into the new workspace experience. This will initially be an opt-in migration, which a workspace Admin can perform. Based on customer feedback, we will then announce when we will automatically migrate all App workspaces built on Office 365 Groups into the new workspace experience. Content packs will not be available in the new workspaces experiences. Once existing app workspaces are migrated to the new workspace experience, content packs will no longer be available. Below we discuss what will replace content packs in the new workspace experience. We introduced Power BI apps to simplify how to distribute content to end users in Power BI. With a centralized app list and one click installation, finding and using Power BI apps is easy. The usage of apps now dwarfs that of content packs, validating the direction we’re heading. Power BI apps will be the replacement for content packs. At the same time, we know customers are using content packs and that the Power BI apps are not yet ready to fully replace content pack capabilities. We continue to support content packs to ensure customers are successful and will support them in app workspaces built on Office 365 Groups, so your existing processes are not impacted. With the new workspaces experiences, we’re starting our journey to discontinue content packs and fully replace them with Power BI apps. We’ve said in our documentation this would happen, but now with this preview we’re taking the first concrete steps in that direction. In the new workspace experiences, you cannot create or install content packs. You can plan by recreating your content packs as Power BI apps so that you’re ready for the migration to the new workspace experiences. During the required migration, we will ensure you keep your content in your workspaces, and they will work like a personalized content pack connected to a dataset just like you’d achieve if you used the forthcoming dataset discovery experience. We’re also adding new navigation experiences to Power BI apps to make them look amazing and super easy to use. As we add the above capabilities you’ll be really happy you moved over to Power BI apps. As with any preview, there can be known issues that our team will address in coming incremental releases. See our documentation for a list of currently known issues.